The Audi A5 is available as a two-door coupe (shown). The refreshed A5 has redesigned headlights, a flatter front end and cleaner engines. BERLIN -- Audi's updated version of the 34,200-euro ($47,050) A5 coupe went on sale Friday in Europe and will run right into the region's sovereign debt crisis. "I need a practical vehicle," said Karl-Heinz Grohe, a 41-year-old director at a Hamburg advertising agency who rejected the car in light of a potential recession in Europe. "The A5 is a head-turner. It's more of a prestige car for people looking to boost their image." The A5, available as a two-door coupe, four-door Sportback and convertible, is a key model for the Volkswagen AG unit. Positioned between the best-selling A4 and A6 lines, it underscores the brand's sporty image for mid-range luxury buyers and helps increase profit margins. Audi accounted for 44 percent of VW's operating profit in the first nine months of 2011. It needs the A5 to boost sales so the carmaker can hold onto the No. 2 spot in luxury cars after passing Daimler AG's Mercedes-Benz just this year. It won't be easy. Mercedes is better positioned for what could be an austere 2012, analysts say. Fueled by a new line of less expensive and more utilitarian compact cars, Mercedes is poised to outsell Audi next year, while BMW will likely extend its luxury lead with next-generation models of the 1 series and 3 series, according to research firm IHS Automotive. Audi, which aims to overtake BMW as the luxury-car leader by 2015, may drop back to third in 2012, with sales growing 6.7 percent to 1.33 million vehicles, while Mercedes is projected to grow 10 percent to 1.36 million cars, IHS forecasts. BMW will likely expand its sales lead with 1.47 million deliveries next year, the research firm estimates. 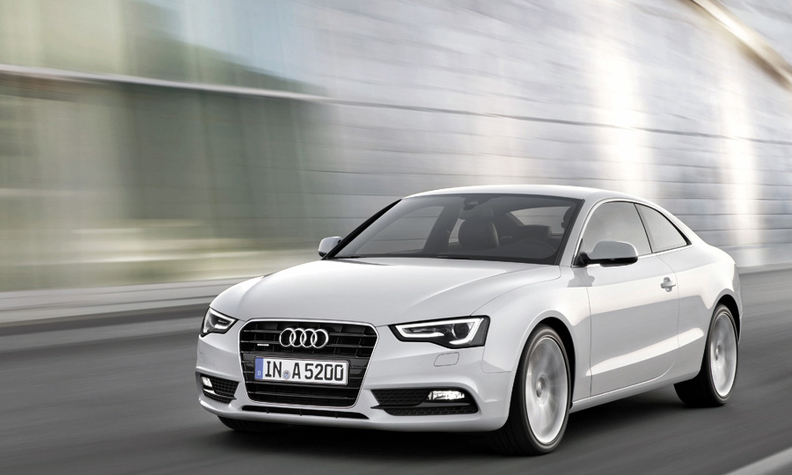 The refreshed A5 has redesigned headlights, a flatter front end and new steering wheels. Cleaner engines reduce fuel consumption by 11 percent on average. The high performance, 335- horsepower S5 variant, which costs 58,500 euros, accelerates to 100 kilometers (62 miles) per hour in 4.9 seconds. "There's no doubt that for Audi, the A5 is driving the image," Peter Schwarzenbauer, the carmaker's sales chief, said in an interview. "It's a design icon in the middle class, similar to the role the TT and R8 models are occupying in the sports-car segment." Audi's former design chief Walter De Silva, who now heads styling for the VW group, hailed the A5 as "the most beautiful car that I've ever designed" when it came to market in 2007. The A5's launch helped almost double sales of Audi's mid- range offerings, including the A4 and Q5 sport-utility vehicle, to 600,000 vehicles last year from 300,000 a decade earlier, Schwarzenbauer said. New customization options with the updated version may help win over design-oriented customers, he said. "The A5 carries good incremental margin for Audi," said Michael Tyndall, an analyst at Barclays Capital in London. "As a sister model of the A4 sedan, we assume it costs broadly the same to produce, but sells for more money." The A4 starts at 29,900 euros, 3,450 euros less than the A5 Sportback. Still, sales of the two-door coupe may gain just 1.6 percent to 41,700 vehicles in 2012, as it gets outsold by the new coupe version of Mercedes's C class, according to IHS. BMW's 3-series coupe, which is heading toward the end of its life span, also sells more than the A5, the research firm says. "The middle-class coupe segment is fiercely embattled among the big three," said Henner Lehne, a Frankfurt-based analyst at IHS. "It somewhat reflects the heightening race for dominance in the overall luxury market." Audi's race for Grohe may be over. The advertising director, who drove Audi cars for 15 years before switching to a used 3 series, is considering the 1 series and the Lexus IS in search of better value. "The A5 made a big splash at the time through new design features, but the excitement has waned," said Ferdinand Dudenhoeffer, director of the Center for Automotive Research at the University of Duisburg-Essen, Germany. "The boom at Audi is nearing its saturation level."